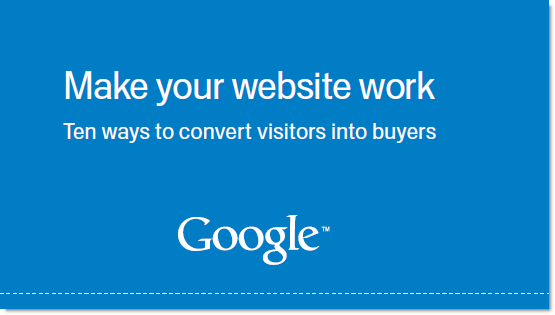 Google released a free ebook on how to improve your website. This book offers 10 tips on optimizing various aspects like home page design, navigation layout, site search, registration process, etc. If you own a website that offers online services and products then this 28 page ebook is must read to convert your website visitor to buyers. Even if your website does not sell any products online, you can still read the book to understand the common mistakes we do and how to rectify them. Find the optimal page layout: Show visitors a clean and easy to understand homepage which isn’t cluttered and has all relevant information available on the top of the page. Make product/service categories visible: People need to see how to navigate in order to do so. Use clear labels/titles that show what product and service categories you offer. Build a navigation structure that is intuitive and not too complex. Make site search visible: Visitors to your site should be able to see, at a glance, where to search. Consider enlarging your search box or making it more prominent. Provide clear images: Customers like to have a clear view of what they’re buying. Make pictures large, and easily visible. Make registration easy: Try to reduce the amount of information required to register. Stick to the details you really need. Offer security: Make sure your pages are secure, and include known symbols to indicate this e.g. padlock symbol.